I was unprepared for my first sight of the Field of Miracles. We approached the site on foot via a twisting route from the large car and coach park northwest of the city. Along the way we passed numerous stalls selling souvenirs of various types. As we got closer, we followed along an earth colored medieval wall. 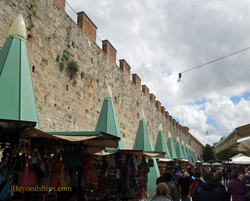 It seemed like it was going to be another cluster of dreary medieval structures converted over to the tourist trade. But after going through a gate in the medieval wall, I found myself in a large, grass-covered quadrangle. Across the wide expanse of the field were three greyish, white buildings that seemed to gleam in the afternoon sun. It was a sight far removed from the dark, brooding medieval cities that we had seen elsewhere during our tour. Bathed in light, this vision seemed other worldly. This was undoubtedly the reaction that the builders of the Field of Miracles must have hoped their structures would evoke. The Field of Miracles was built as a place of worship. It was designed as a unified whole that would trigger thoughts of God and Heaven. It was to be a place much different than what people saw during their everyday lives. It still is. Most of the people that come to the Field of Miracles these days do not come for religious reasons. Many are content just to pose so that friends or family members can take photos of them holding up the Leaning Tower. However, it is possible to ignore all that and get a spiritual lift from the beauty of the place. The Field of Miracles (Campo dei Miracoli or Piazza dei Miracoli or Piazza dei Duomo) is not in the center of Pisa. Rather, it is on the northwestern outskirts of the city. In the 11th century, Pisa had achieved great power and prosperity and the idea was to build a new cathedral that would reflect Pisa's new status. About a century after the Cathedral was begun, a Baptistry was added to the complex and then a few years after that, a free-standing bell tower or Campanile (now universally known as the Leaning Tower). These three buildings are the ones that we see today on the great green lawn. In the 13th century two structures were added on the sides of the lawn. On the north side, a white stone cloister was built as a cemetery. On the opposite side, a hospital was constructed. The hospital is now a museum housing preliminary sketches for frescoes that once adorned the Cemetery. Above: The Cemetery on the northern edge of the Field of Miracles. There are a number of legends associated with the Field of Miracles. Some of these concern the scientist Galileo Galilei (1564-1642). According to his secretary, Galileo dropped two balls of different sizes from the top of the Leaning Tower to show that they would hit the ground at the same time thus proving that objects fall at the same speed regardless of mass. Similarly, Galileo is said to have developed his theories on pendulums by watching a swinging incense lamp suspended from the ceiling of the Cathedral. During World War II, reports were that the Germans were using the Leaning Tower as an observation post. An American sergeant sent to confirm these reports was so struck by the beauty of the Field of Miracles that he was unable to call in an artillery strike thus preserving the buildings. Today, the Field of Miracles is one of Italy's most popular tourist attractions. Cruise ships calling in Livorno typically offer shore excursions to the Field of Miracles. It is also possible to get to Pisa from Livorno by train. Above: The Museo delle Sinopie, once the medieval hospital, is now one of two museums bordering the Field of Miracles. The other museum, Museo dell'Opera del Duomo, has nothing to do with music. Rather, it houses various treasures from the monumental buildings.